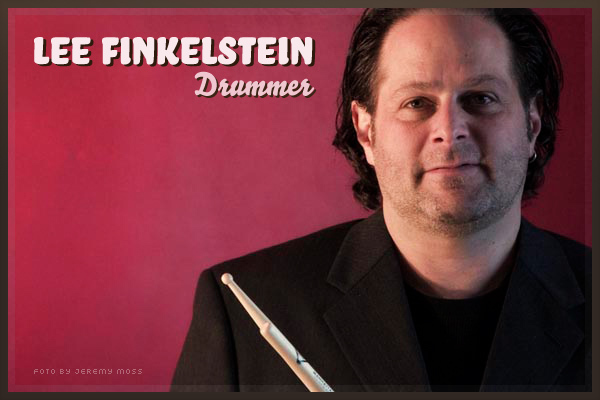 In a career spanning over twenty five years, Lee Finkelstein has built up a reputation as one of the funkiest and most versatile drummers in New York City. Lee currently tours the world with The Original Blues Brothers Band and has played with artists as diverse as Tower of Power, Ben E. King, Donna Summer, along with "driving the bus" and co-founding Funk Filharmonik. Lee has recorded, performed with and backed up Ray Charles, Stevie Wonder, Nancy Wilson, Grover Washington Jr, Eric Gale, The Oregon Symphony Orchestra & Randy Brecker, Isaac Hayes, Eddie Floyd, Bette Midler, Blood Sweat & Tears, Russ Freeman, Julio Iglesias, Frankie Paul, Johnny Winter, Steve Cropper, Lou Marini, Will Lee, Paul Shafer, John Tropea, Leon Pendarvis, Alan Rubin, Saturday Night Live, Dave Valentine, Cornelius Bumpus, Anthony Jackson, Mary Wilson, Daryl Hall, John Oates, Hudson River Rats, Joey Ramone, Vaneese Thomas, Mario Cruz, Jens Wendelboe, Don Blackman, Oz Noy, Buzz Feiten, Neil Jason, Deena Miller, Dave Fields, Jay Prince, Bill Heller, Cosmic Oven, Derretub Snub, Hadrian Decree, Red Flannel Hash Band, Small Talk/Jim Small Band, The Paper Bag, Timberwolf, Yasgur's Farm, Jim Pin Band 5+2-1, Eclipse, Funk Filharmonik, The Zen Tricksters, Major Domo, Chick Singer Night NYC, Jonny Rosch, Bobby Harden, Stevie Cochran, Ed Palermo Big Band, Napoleon Murphy Brock, Wycliff Gordon, Victor Jones, Louisiana Red, Marc Ribler, Jack Daley, JT Bowen, Southside Johhny, Bowling For Leftovers, Marc Muller, Dead On Live.